Wine That Rocks! 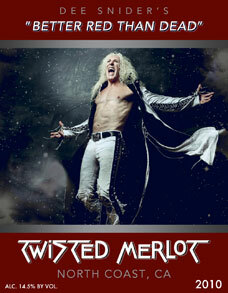 We’re thrilled to debut our latest rockstar collaboration: a 2010 Twisted Merlot from Dee Snider of rock band Twisted Sister. This limited edition Merlot from the North Coast is crafted in a robust fruit forward style. Retail $36 / Members $29. A portion of the proceeds will go to charities selected by Dee Snider. Buy here. To order: Fill in bottle quantities then click the ORDER NOW button at bottom of list of wines. You must be at least 21 years old to purchase wines. Wine shipment must be signed for by person at least 21 years old. Daniel “Dee” Snider is an American singer-songwriter, screenwriter, radio personality, and actor. Snider came to prominence in the early 1980s as lead singer of the heavy metal band Twisted Sister.